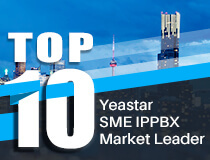 Yeastar S-Series PBX has passed the compatibility test with Deutsche Telekom, and our device has offered the SIP trunk template for fast configuration. This manual will offer some important tips and some recommended configuration examples for your reference. As we know, Deutsche Telekom offers two types of trunk generally, which is LAN IP Voice and LAN SIP trunk. Before we start the configuration, we need to prepare something first. Check the exact DNS address offered by Telekom and configure it in PBX’s network settings page. 8.8.8.8 Or any other DNS address would no work. Most of the unable to call in/out issue is caused by invalid DNS configured. 4. If you use the LAN SIP Trunk, we must enable TCP protocol at PBX side, it's very important. When the network configuration is finished, let’s input the SIP trunk info, here are two example configuration for these two different type of trunks for your reference. When done, save it and apply changes, then check if the trunk’s status is fine. Tip: The Caller ID number and Caller ID name filed are needed, it’s important. If the trunk’s status is not good, we need to check network settings at router side and PBX’s side, sip trunk’s authentication details. Telekom allows two types of number to dial, which is 0+number or +49+numbers, so we can configure the outbound route’s dial pattern like this. There are two types of DID offered by Telekom as well, which is 0+numbers and +49+numbers, the value may exist in different headers, sometimes it’s the same, but sometimes it’s different. The default place to resolve the DID is in ‘To’ header, In this example package, the INVITE and To header’s value are the same, which is +49XXXXXX. The DNS server address in WAN port. When these configurations are checked, the calls are working fine. 1. Keep the outbound parameters and transfer parameters like this. 2. Keep the ‘Allow RTP Re-invite’ to be default NO, if it’s enabled, there will be no voice when call is transferred to external side via Telekom. If you still have trouble to call in/out, feel free to submit ticket in https://support.yeastar.com to contact us. We need your help to enable this packet capture on web (no need to input anything in IP and port field), click start, then dial test calls to make the issue happen, when done, stop it and download it. For more detail, please check How to get PCAP dump capture. You can also open it using winrar first, then analyze it using wireshark to get the exact DID value.